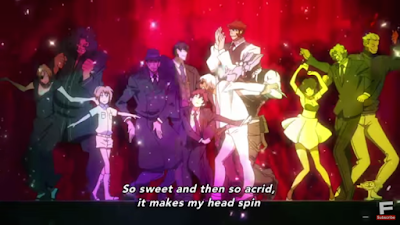 Subdued Fangirling: Subdued Fangirling's Top 10 Anime of 2015! Subdued Fangirling's Top 10 Anime of 2015! Happy New Year everyone! I’ve been spending my winter break playing video games and taking a rest before I have to jump back into work next Monday, but I can’t let the year end without sharing my favorite anime series from this past year! These are presented in no particular order other than numbering, but I do have an all-time favorite show of 2015! I hope that everyone is having an excellent New Year’s Eve or New Year depending on your timezone! Here’s to another year of great anime! A late entry onto the list, but one that deserves praise all the same! I had a feeling that I would enjoy One Punch Man when I accidentally ended up at Viz’s license announcement at AX this year, but when the show came out, it blew me away. The incredible animation combined with a keen sense of humor about superhero tropes make this an all around fun show, and a great title to share with people who are outside of anime fandom. I was a little concerned at the outset that One Punch Man might become repetitive, but it solved this problem by introducing a wider cast of characters and adding in some worldbuilding that served it well. The result is an all-around good time. 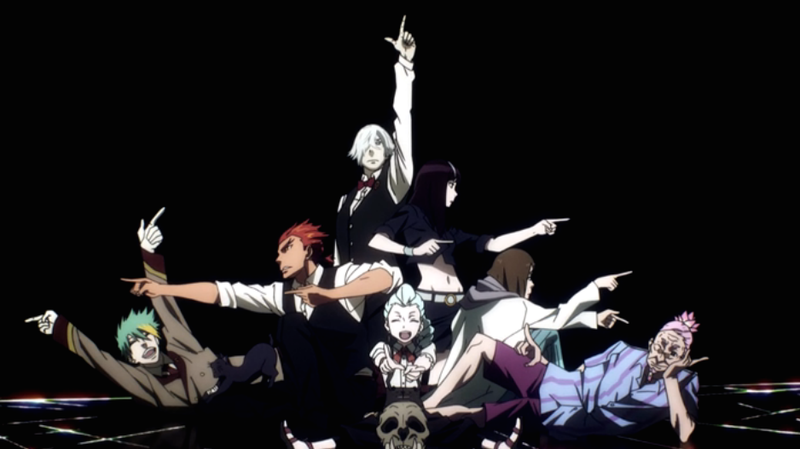 IF you see nothing else from this year, watch at least the opening episode of One Punch Man. It is one of the few shows that deserves the hype that surrounds it. While I was disappointed in Gatchaman Crowds Insight in the end, the show is still as interesting and thought-provoking as its first season was. 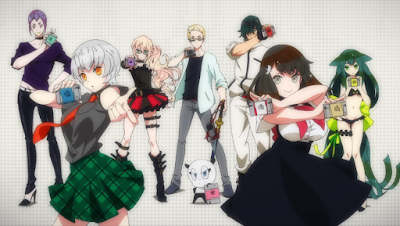 Serving as its own counter-point to the themes that it brought up in the first season, Gatchaman Crowds Insight swaps out its theme of assuming the best in everyone as begins to assume the worst, culminating in monsters that feed off of the oppressive atmosphere in social interactions. While I felt that it took the “everything is symbolism” angle a bit too far this time, I can’t say that I didn’t enjoy the ride and how it made me think about my own worldview and beliefs. Gatchaman Crowds Insight is the type of show that reminds me that differing opinions are what makes art /art/, and the resulting discussion can be just as valuable. I ended up marathoning this show about a month after it finished airing, and when I did I could see why so many people were touched by it. I put off watching it initially because I’d heard that it was a drama about middle school students, and since I work with that age group I wasn’t interested in watching more of that in my spare time. However, I’m glad that I listened to the praise and gave it a try. Your Lie in April is one of two shows this year that deal with teenagers and their instruments, although this one is the far more tragic of the two. It strikes a great balance between portraying the music and its character arcs, and the latter gradually gets to the point where it encompasses the whole narrative. How well this show works depends on how much the viewer is able to buy into the two main character’s individual stories, and I thought that they were developed well. 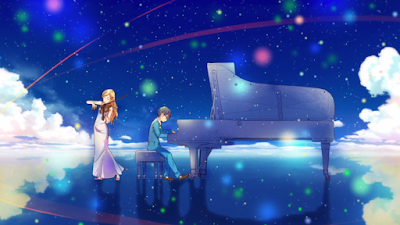 As a character drama, Your Lie in April is easily one of the best of the bunch with emotional punches to the gut that are earned over its runtime. This show is easily one of the best shoujo fantasy series that I’ve seen in years, and my only complaint is that it stopped. 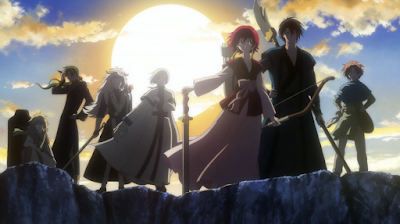 Drawing from old-school staples like Fushigi Yuugi, Yona of the Dawn takes the “girl destined to do great things with her reverse harem” plotline and elevates to an epic fantasy with a world that feels real and characters that are just as believable. But it’s the title character Yona who really makes this show work, and I was in awe from watching her character grow from a spoiled princess to a warrior who wants to grow stronger in order to protect her friends is some of the best character development I’ve seen in anime period. I’m really excited for the manga’s English release this next year so that I can continue to follow the story, and I’m still keeping my fingers crossed for another season! The creator of Trigun returned this year with a supernatural New York and crazy cast of characters, teaming up with studio Bones to create a show that is dripping with creativity. From huge monsters stomping around the city to hilarious character interactions and even a surprisingly poignant episode about a mushroom monster who just wants some burgers, this show was entertaining from beginning to end. The wait for the final episode was more than worth it, and if you haven’t checked it out yet, now is great time to do so! KyoAni is really just knocking them out of the park lately. This show follows a high school band with a specific bent towards the brass section. 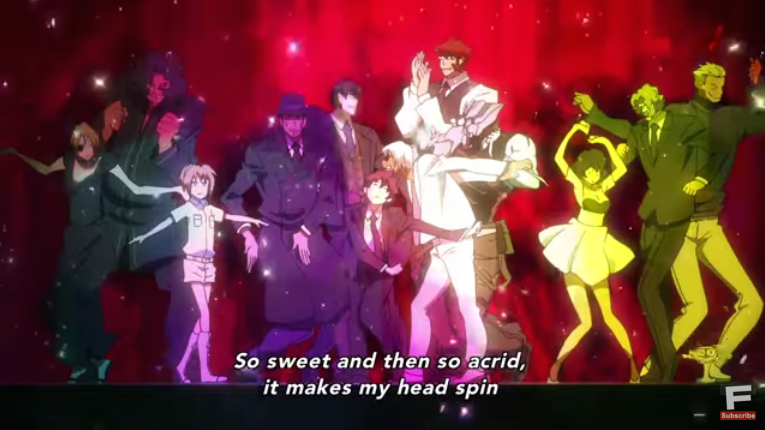 The portrayal of the band is the most accurate I’ve seen in anime (also I call BS on them learning to march perfectly in line in just one day), and its one of the few shows where anime has pressed that nostalgia button for me, since I left band behind over a decade ago. 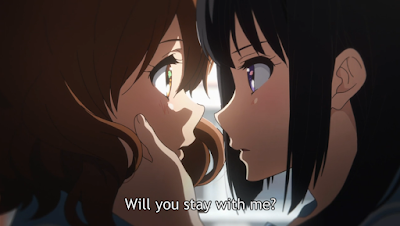 And while the show was already fantastic just on those merits alone, it upped the ante by then focusing on the relationship between Kumiko and Reina. I’m going to hold off on any discussion about whether or not this show is queer-baiting until the second season airs, but for now I’m happy that an anime has decided to lean heavily into the yuri hints without being leery about it. Come for the band and stay for the characters! I was concerned at first that School-Live! wouldn’t have much more than it’s first episode twist, but it grew into one of my favorite shows from this year. A lot of its success has to do with the fact that it does not rely to heavily on genre tropes—although I will not specify which genre I mean in order to avoid spoilers. Instead, it also invites the audience to examine everything that is happening in front of them while it turns those same tropes on their heads. While I felt that parts of the finale where a little too on-the-nose, School-Live! was both an edge-of-my-seat experience and a tearjearker to watch, and I recommend it to anyone looking for some surprising cross-genre stuff in their slice-of-life. If you had told me last year that one of the romances that I would become most invested in would involve two characters who considered it lewd to hold hands I would have laughed at you. However, each episode of this show never failed to put a smile on my face. It’s not just literally a love story, but also about how these characters elevate each other to become better people. It’s not about the journey to the relationship, which is what most romance anime focus on, but the development of the relationship itself. It also helps that these characters are such a joy to watch; if they were characterized any differently, I’m not sure if this show would have been so successful. It also introduces the ultimate supporting friend character, who alone makes this show worth the watch. If you want something fluffy without the “will they/won’t they” and dragged out love triangles, My Love Story is your show! 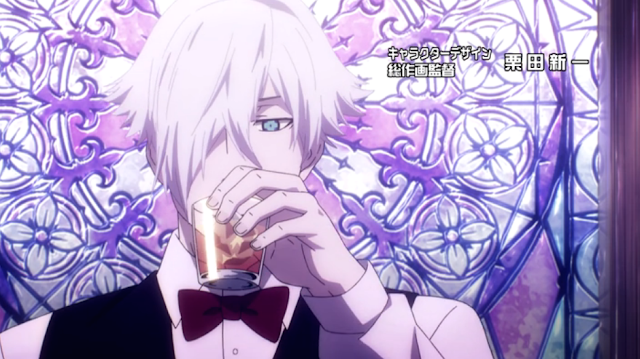 While this one is billed as “the anime about anime,” it’s far more than that. Yes, it is literally about making anime (which has led to a lot of jokes on Twitter about people claiming to be “experts” on anime because they finished Shirobako), but the underlying story about starting out in a career and learning how to juggle your dreams with reality is something that I strongly relate to, especially in the past year as I finished up school and am still trying to get a foothold in my chosen field. This was also the only show that I was watching as I was in the mad dash to finish school, and as hilarious as those tired Miyamori screencaps are, as anyone in their twenties and older can tell you, that is terrifyingly accurate. 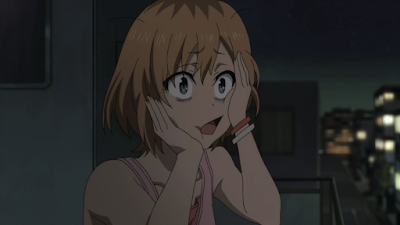 Shirobako provided not only an entertainment escape for me during one of the busiest periods of my life, but was also a mirror to show that I was not alone in the way I felt about trying to make something of myself as an adult. This is a show not just for people who are interested in “behind the scenes anime” but also for anyone that remembers or is living through the experience of starting a career. Thanks Shirobako for showing me that even if I am exhausted and work myself to the bone, I can still be anime. Death Parade is my top pick for a simple reason--the ending moved me to tears. It wasn't a perfect show--the episodic format didn't work as well in the premise's favor as I thought it would, but the ending overrode those problems for me. To have an ending that showed where even in an afterlife that is bent on bringing out the worst in people and punishing souls for having human reactions there are still those who believe in the best of each other was touching to me. While it left a lot of things unresolved, I'm a fan of how it ended with a glimmer of hope. It's nice when things I watch for entertainment can remind me that even though life can be pretty terrible at times, there's nothing futile about hope. Screenshots are from Funimation.com, Hulu.com, Crunchyroll.com, and Daisuki.net. Please support official simulcasts.